Wake up Screaming #6 – An Investigation of Dreams | Wake up Screaming - An Online Art Magazine - Creativity, Spirituality, Self Awareness, Waking up! Welcome, inward explorers. What is your relationship with your dream world? Do you use dreams to inspire you creatively? What are dreams and how can we use them to improve the way we live and create? This edition is dedicated to the exploration of dreams. I strive to record and understand my dreams, they capture me like nothing else. In an attempt to better understand what dreams mean to me and other humans, I opened up this edition of Wake up Screaming for communal exploration of dreams and their relationship to creativity. We received an overwhelming response to this theme, producing our most intriguing edition to date. Here are some examples of how humans are allowing their dream world to seep out into their lives and into their creative work. A big thank you to the artists who have shared their dreams with us. I have been left with the conclusion that dreams are an important focal point for communicative exchange between humans, perhaps the window through which the inner speaks to the outer. Dreams are a means to process experiences and emotions, like the creative process, when combined they create a force for emotional development and spiritual progress. I hope this has been an informative exercise and encourages us to use our dreams as a point of focus for expression in many mediums. The following short story is inspired by a dream I had in September 2017. I had wandered without aim into thick jungle via winding tracks that grew rougher and narrower as the day grew older and darker. My attention was drawn towards the intimate twitching of a forest crab scurrying around the base of a tree. It was night, yet the tree base and its roots were well lit by gradients of blue produced by the bioluminescent behaviour of surrounding mosses. The crab itself had a delicate, transparent shell allowing me to see its organs which produced a bright orange shimmer just below the surface. It was night, yet the tree base and its roots were well lit by gradients of blue produced by the bioluminescent behaviour of surrounding mosses. The crab itself had a delicate, transparent shell allowing me to see its organs which produced a bright orange shimmer just below the surface. The trunk of the tree was broad and grew straight up, it’s bark was smooth and its roots wound outward across the surrounding terrain forming repeating ridges and gorges, growing shallower as they expanded outwards. Each of the ridges was dotted with dainty white flowers, that looked like miniature street lights peering in on the stage. They overlit the gorges, revealing smaller moss-coated valleys that glistened with dew and were spotted with tiny mushrooms. 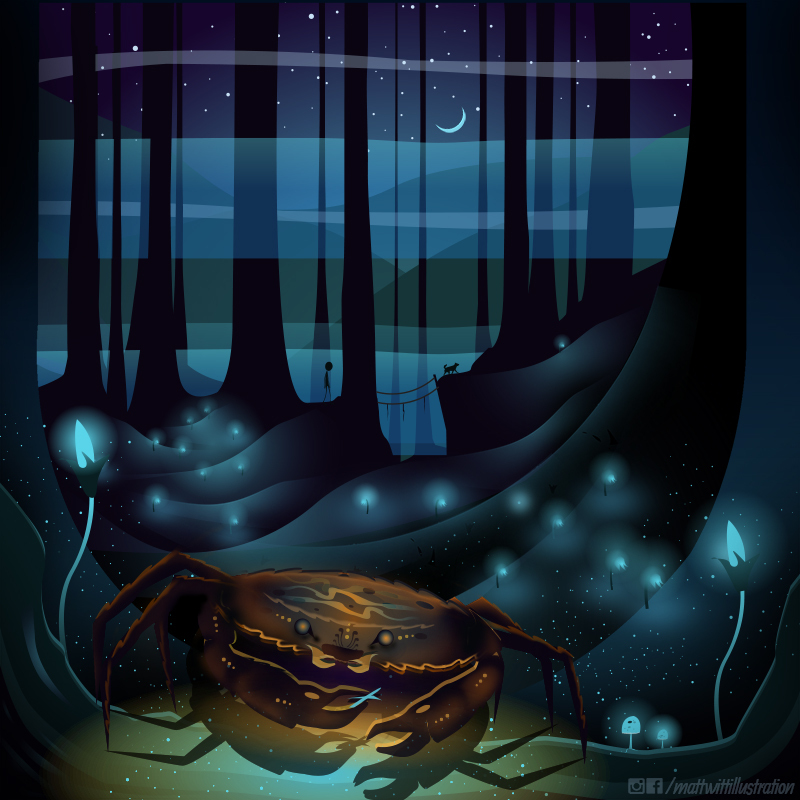 The crab scuttled busily, in and out of the root valleys, seemingly unaware of the deep jungle darkness that dwarfed its dwelling space. Consumed with its work, digging just below the surface to nibble on the tree’s tiny root hairs, clipping them precisely with its pincers as if tending a garden and bringing the pieces towards its nibbling mouth. All of this was occurring at an itchy, hurried pace. The little crab went about his business wholly unconcerned, he behaved as if no danger could beset him. His transparent shell revealed his colourful meat, almost bragging about his predatorily unladen state of affairs. It was as if evolution, fate, or favour had somehow allowed him to live an untroubled life of isolated foraging in amongst the roots of this tree. It was as if he was protected by some overseeing benevolence that we were both yet to grasp. I lost track of time as I became enchanted by the delicacy of the little crab’s actions. The scene was a joyful, intimate and caring exchange; purposeful and naturally pleasing to the eye in all its pulsating night-time technicolour. Brightly bold and full of ideas, I looked in upon this unfolding romance, intrigue inviting me still closer. As the focus remained on this tiny piece of unfolding story, a rich black vignette shrouded the scene and brought into focus an impression that would linger into my waking world. I was aware of being lifted upwards, with the crab, high into the tree’s canopy. The glistening valleys abruptly cascading into a pinpoint. The story and the characters remained, but a profound alteration enveloped the scene. The open expansiveness turned inside out and regurgitated itself as something altogether deeper and more complex. As my bearings steadied I caught glimpses of the emerging scenario. From small visual cues, I was able to deduce that we had ascended, with the help of the tree itself, in the grip of what seemed to be prehensile, telescopic branches. The nimble tentacles plucked the crab gently from the floor as if it had been practised a million times, ceremonious in its intricate attention and delicacy the crab was lifted proudly heavenwards. Then, with a sudden shift of focus towards the tree, I witnessed strands of crab meat hung over a gaping black orifice, lined with dozens of tiny clinging, tweaking and picking claws, all fiddling and moving fully independently yet working in complete harmony. Robot-like, but organic, they manoeuvred with such speed and precision that dismantling a crab could be their only purpose. Each claw had a specific role; a flick or a twist or a scoop. In fact, the entire motion was somewhat crab-like. It ended in the complete devouring of all parts of the crab, in a very particular order, moving clockwise around the circular mouth. The End (or the beginning).